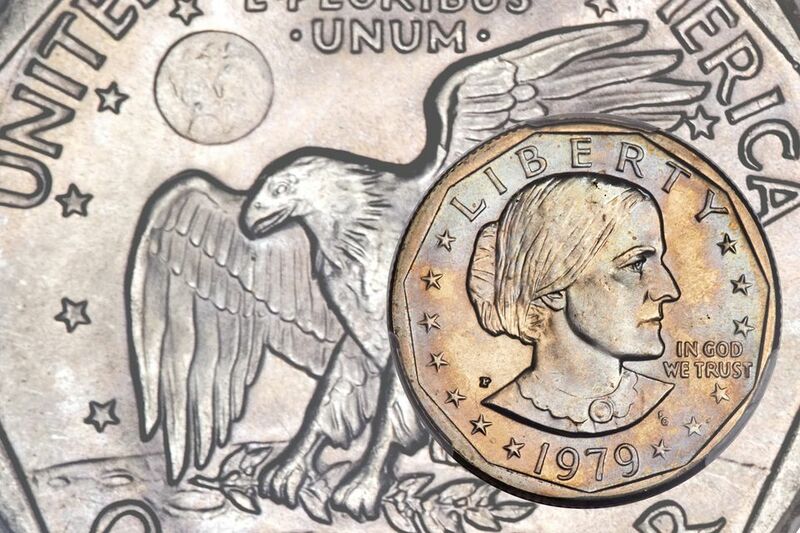 It is not hard to grade Susan B. Anthony dollars since most of these coins never circulated. Keep in mind that coin grading is the expression of an opinion that describes the condition of a specific coin that a majority of dealers and collectors would agree with. Grading is not an exact science where a particular formula can be applied and everyone arrives with the same result. Over the years, numismatists, coin collectors and coin grading services have agreed upon certain definitions, descriptions and Sheldon's numeric values that help all coin collectors describe their coins accurately to a certain extent. This guide will help you understand these terms and descriptions so you can accurately grade your Susan B. Anthony Dollars. The Susan B. Anthony Dollar was a coin that was rejected by the people of America. Most of them confused the coin with a quarter because of its similar size and identical color. Most uncirculated coins were made from coin dies that were overused and showed evidence of fatigue. Sharply struck specimens from fresh dies command high values. Susan B. Anthony Dollars were first minted in 1979. Unfortunately, they were rejected by most of the people in the United States and they never circulated widely. Therefore, most of the coins you find will be uncirculated or about uncirculated. Any lower grades will only be worth face value. The photo illustrates the highest points on the coin's design (indicated by the color red). 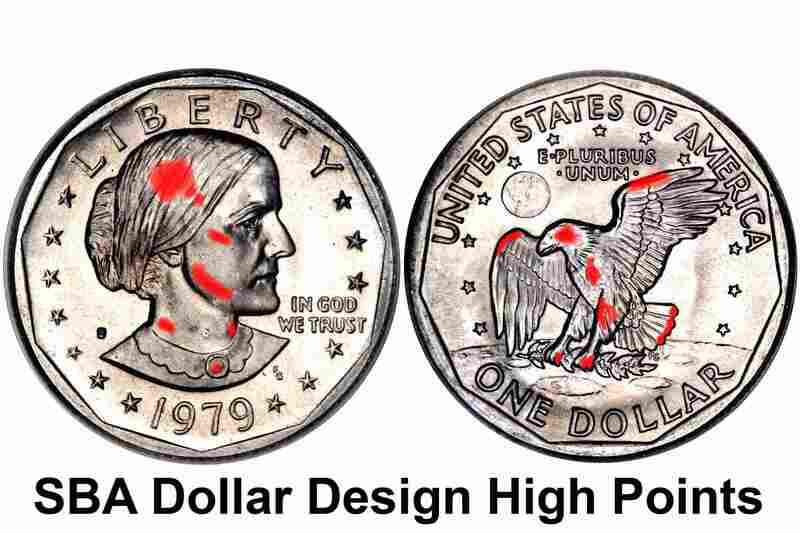 If you think you have an uncirculated Susan B. Anthony dollar, look at these areas on the coin first to see if you can spot any wear. If there is wear, then it is not uncirculated. Most commonly you will notice a lack of mint luster in those areas. Susan B Anthony Dollar Graded AU-55. Summary: An About Uncirculated-55 coin has very minor traces of wear or abrasions and they are visible on only the highest points of the coin. Mint luster is almost complete and the surfaces of the coin are well preserved. This is the most common grade for Susan B. Anthony dollars that have circulated. Most of the wear is from the coins being stored in bank vaults and tellers moving them around. Obverse: Small traces of wear will be visible on the design high points, particularly on Anthony's cheekbone and on her hair in the center of her head above her ear. Reverse: Traces of wear will show on the design high points especially on the Eagle's neck and feathers atop each wing. Susan B Anthony Dollar Graded MS-63. Summary: No traces of wear from circulation exist on a Mint State-63 coin. Mint luster is complete but shows minor impairments. Many contact marks, bag marks and hairline scratches are visible without magnification on the coin's field and major design elements. Overall, the coin has an attractive eye appeal. The strike may not be particularly sharp and the dies may be worn. This is the most common grade for uncirculated coins. The mint did not give these coins much attention when it came to producing a quality product. Obverse: A few scratches and contact marks will be visible without magnification. You will usually see these on the cheek and hair above Anthony's ear. Reverse: Scratches and contact marks will be evident on the eagle's breast feathers in in the field. Susan B Anthony Dollar Graded MS-65. Summary: A Mint State-65 coin has high quality mint luster that completely covers the surfaces of the coin and is undisturbed. Contact marks and bag marks are few and small. The coin is well struck from dies that do not show excess wear. A few hairlines may be seen under a magnifying glass. Overall the coin is brilliant and has an above average eye appeal. Obverse: A few small and scattered contact marks or one or two larger marks are visible without magnification. Look on Anthony's cheek in the hair above her ear. Reverse: One or two small contact marks or scratches will be visible without magnification on the eagle's breast feathers or in the field. Susan B Anthony Dollar Graded MS-67. Summary: For a coin to grade Mint State-67, the original mint luster must be complete and almost perfect. There are only three or four very small and unnoticeable contact marks. Overall, the coin has an extraordinary eye appeal that is hardly ever seen. A few minor hairlines can be found only with magnification. The coin must be well struck from dies that show little evidence of wear. Given the lack of attention to quality when the U.S. Mint produced these coins, find an MS-67 or high is highly unusual. Obverse: No traces of wear are evident anywhere on the coin. There are no distracting marks and the mint luster is above average. Reverse: All details of the coin are present even on the highest points of the coin and the eye appeal is superb. I have been a coin collector for a majority of my life, I have witnessed the evolution of coin grading standards over the last forty years. Most recently, I have studied coin grading with professional coin graders from NGC and PCGS. I have researched coin grading in books and worked with coin dealers to improve my skill set. Coin grading is an opinion that one person believes reflects and describes the condition of a given coin. The information presented in this article is my opinion on how to interpret the many coin grading standards that you will encounter. This is not a universal, absolute and definitive definition on how the Susan B. Anthony dollars series should be graded. I recommend the following books to help you further develop your coin grading skills. Clicking on the links below will find the lowest prices on the Internet for you.